Not your typical terrifying walk through, this interactive theatrical presentation still offers plenty of scares. The manor boasts to be one of Pennsylvania’s most unique haunted attractions and to that we agree. Year after year Gravestone Manor delivers a fresh new performance to keep you coming back for more. They aim to introduce new custom set builds every other year. We were most delighted by the special feature in the last room which we learned was inspired by the owner’s childhood fascination with toy trains and engineered on-site by the owner himself. This feature was introduced last year for those of you who will be returning, but used in a different way this year and we still LOVE it! It is abundantly clear that the owner takes great pride in creating something new and entertaining each year. It is passion that has kept this non-profit attraction going strong for 19 years and counting. Impressive! The volunteer based cast was comprised of local theater group actors and high school students who did a great job delivering their lines without glitches. Their performances were intended to be more theatrical than realistic, which was well received by the audience. The characters engaged with the group well and were easy to understand. The narrator, also a character in the story rather than just a tour guide, tied everything together from one room to the next to keep the storyline on track. We were very impressed with how well everyone remembered their lines and acted with such enthusiasm. The tour guide played a psychic medium trying to solve a mysterious murder from years ago. He had to be with us every step of the journey through gravestone manor and deliver more dialogue than I’d even expect to encounter at any haunted attraction. To think that they have at least two more of these tour guides doing the same show over and over throughout the night is just incredible to us! Both the narrator and the main characters were dressed in normal clothes which worked fine for the roles they played. As we travel back in time to the night of the deadly dinner party, we see characters in the ghoulish garbs you expect to see in any haunted house. We started to get a little confused as to the choice of costumes and characters when the story was clearly set at a regular suburban dinner. At some points we were getting startled by hooded zombie types and some tormented ghost types and couldn’t really see the connection. Although at a point in the story we started to understand that some of the costumes and props we were seeing started to make a little more sense. When it comes to costumes there is something I always look for and that is to make sure that the character is completely covered. Not many things irk me more than seeing regular shirts and pants and shoes when the costume calls for everything but regular. Fortunately the cast of Gravestone Manor do very well in this department and make sure there is no sign of normal clothing when they are playing their unique roles. Because of the location there isn’t much that can be done about the driveway situation. There is a sandwich board on the road but it is a little difficult to see and a little sketchy to drive onto if you’ve never been there before. The driveway is on a very steep incline and directly off a relatively busy road so stopping to make sure you are at the right place isn’t always an option. The atmosphere caters to its supportive community. The darkened warehouse room converted to a movie theater provides a nice transition space. Guests of all ages filled the room with excitable chatter, but the movie can still be heard by those who want to watch it. The atmosphere in the manor is dark and creepy as any haunted house should be. The parking lot is almost completely absent of anything showing this would be a haunted attraction. The second we walked inside we were met by a giant reaper skull hanging above us. There is even a nice Frankenstein’s monster to gaze upon before entering the waiting area. Another thing that impressed me is the lack of noise we could here from the other groups. We knew well enough that we were not the only group going through the attraction and that we weren’t in a giant warehouse where the next group might be a hundred feet away. Gravestone did a great job making sure that the next group’s adventure didn’t spoil anything for us. 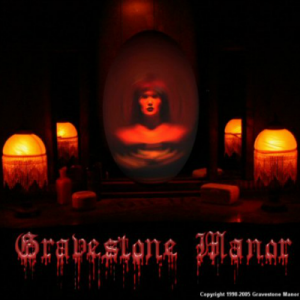 As you walk through the rooms of Gravestone Manor, each room has its unique sound and light spectacles that are incorporated into the story. In 2 different areas, there was creative use of reflective technology to create the illusion of the ghouls that now haunt the manor. Other spooky trickery was centered around getting answers from the hands free, animated Ouija board which we encountered in 2 different rooms as we called upon the repressed subconscious memories of the main character. The lingering spirits seemed determined to interfere with our attempts to learn what really happened. A familiar room but great nonetheless is the living room which seems to completely come to life. The couch eats a victim, a flying monkey figure lifts into the air, a coat rack starts to rattle, the coo coo clock goes crazy, those kinds of things. It may be the last year to see this spectacle as we are told everything is going to be completely new next year. Each year Gravestone Manor changes things up with a brand new script. This year we walked through the hallways of the manor with a psychic who had the mission to solve a cold case by exploring the repressed memories of a young woman who witnessed a deadly crime as a child. She was the sole survivor and unable to lead the police to the killer. Though the girl is now an adult, she presents with a child-like personality as we explore the buried memories of her past. Much like a child, it is hard to keep her on track to get the information we need. At some point in the story we find out that it might not be only her memories that we are looking into and physically being a part of. This is a perfect attraction for someone who wants to feel an adrenaline rush without the lasting trauma. It is intended to be more conceptual in nature than gruesome and awful. Still, as previously mentioned, there are plenty of scares to keep you on edge. The creativity of Gravestone Manor played the biggest role in their fright strategies. Walls would open in weird locations you wouldn’t expect and take you to rooms that at first didn’t make sense. When you go to as many haunted attractions as we do you can’t help but naturally think about what the next room is suppose to look like. The living room of a haunted house should lead you into a kitchen or a dining room and a graveyard usually has a tomb or a catacombs and things of that nature. At Gravestone Manor the direction has been more to jump around different locations in the past, present, future, and even in the deep subconscious of the mind like a dream world. This attraction is not recommended for children under 8 years of age. We walked through with a group containing 3 eager 8 year olds who lost more and more of their bravery with every new room. The ghouls within the walls exposed their vulnerabilities and even revealed the inner demons of a troubled mind within our group, yikes! Tickets are very affordable at $10 per person and as an added bonus you get to feel good that proceeds go to a charitable organization, the United Way of Wyoming Valley. This year marks a 19 year partnership with the United Way. The attraction lasted us a good 19 minutes giving Gravestone Manor a Minutes per Dollar value of 1.9. A dollar for every two minutes you spend in a haunt is a great price. Given the fact that this isn’t your typical jump out scares and rather an interactive theater experience, this is one of the best attractions you can visit in October. Quality guided entertainment begins right away and is maintained throughout the journey. You are delivered abruptly to the parking lot at the end which may leave you wanting for more, but given the great price and quality entertainment we still value this attraction as one of the greatest in the area!